Submit your unique plant or animal genome proposal for a chance to win free de novo assembly services on PacBio SMRT Sequencing data. See details below. De novo genome assembly is a complex task, which can require massive computational resources to weave long-reads into a final, polished assembly. Plants and some species of animals can prove particularly challenging due to their high levels of genetic diversity, repetitive elements, and duplicated genomic regions. Bringing together multiple technologies (long-read, short-read, next-generation mapping) can improve contigs and scaffolding to provide more complete and accurate genome assemblies. At DNAnexus we have a team of scientists that provide fast, accurate, and cost-efficient reference quality assembly services. Our key experience includes 3000 Rice Genomes Project, Vertebrate Genomes Project, along with many complex individual assemblies, including the tobacco genome (4.5 billion base pairs, tetraploid & highly repetitive) and the immune recognition regions of the Rhesus macaque. Join us, in collaboration with our partners PacBio and Microsoft, for a webinar – Best Practices for Rapid Reference-Quality Genome Assembly – which takes place September 5th at an APAC friendly time 10:00 AM (China Standard Time). Register today. For the webinar case study, the La Jolla Institute for Allergy and Immunology and University of Louisville utilized DNAnexus de novo assembly services to serve the need for a better quality R. macaque reference genome for the research community to use. The R. macaque genome provides a good reference for use in vaccine trials in order to understand both efficacy and antibody response. Examining this response though proved challenging as the research community lacked the full picture of the genome. Although the genome assembly of primate is not difficult in general, the DNA regions involved in immune recognition are difficult because of the highly repetitive and segmental duplication and haplotype variation between individuals. DNAnexus scientists were able to assemble the genome to get 2.8 billion base pairs out of the entire genome with an N50 of contigs length of 8.4 million base pairs and N50 of haplotype contigs length of 451,000base pairs. 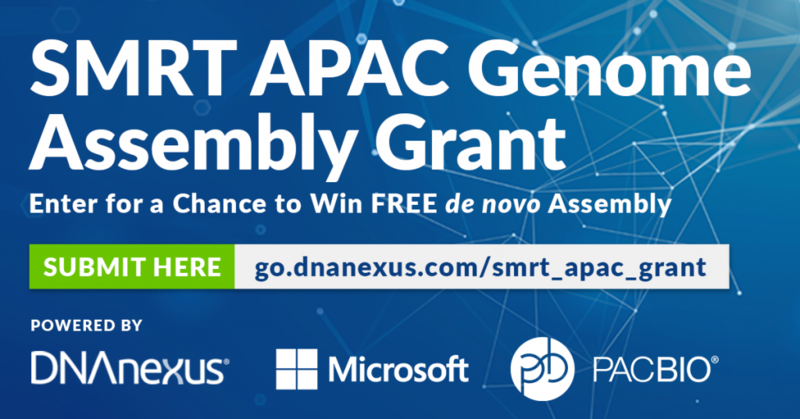 DNAnexus, is excited to announce the SMRT APAC Grant powered by DNAnexus, through which we are offering free de novo assembly for the most unique plant or animal genome in the world. One lucky winner will be selected for DNAnexus de novo assembly services on PacBio SMRT Sequencing data. To enter simply submit a 250-word proposal, which includes a short description of your particular plant or animal genome, (up to 1.5 Gbp in size), and how its sequencing and de novo assembly would benefit the larger scientific community. We are now accepting submissions on the SMRT APAC Grant website. Please note de novo assembly services will only be applied to data generated through PacBio SMRT Sequencing and sequencing is not included in the SMRT APAC Grant. Deadline for submission is September 30th with the winner announced the week of October 8th. Do you have genome that needs to be assembled? Learn more about our de novo assembly services or request a quote.